In honour of World Oceans Day, we're talking about how ecotourism is transforming the way people travel and the small changes we can make to keep the world's land and oceans clean – and what better way to celebrate our planet than by packing your suitcase and whisking away to discover a new destination? Before you grab your passport, we've rounded up 7 useful ways you can go green during your travels – give it a try, it's easier than you think! Choose a destination that upholds environmental protection standards. Cities like New York, San Francisco, Amsterdam, Vancouver, Copenhagen or Berlin boast a variety of eco-friendly accommodation, organic restaurants, green boutiques and public transportation. Amsterdam's vibrant city has a great infrastructure for bike routes, including protected paths, racks and parking. New York also has an extensive network of Subways, bikes and hybrid cars, making your holidays in the Big Apple as ‘green’ as can be. For eco-friendly beach holidays, jet away to the pristine Gerakas beach in the Greek island of Zante, or hit the captivating white-sand Las Islas Cies beach in Spain – you’ll find the perfect balance of enchanting scenery and a strong commitment to environment conservation. 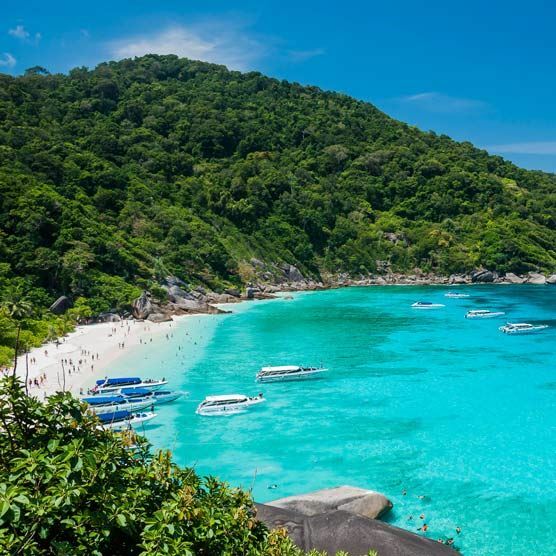 Green Trivia: Ethical Traveler, a non-profit organization, publishes an annual list of world destinations ranked by their environmental protection standards. When you visit these places, your money supports their efforts to create sustainable tourism. There are plenty of accommodations that have been certified by a recognised eco-labelling scheme – such as the Green Tourism Business Scheme in the UK, the European Eco Label and Green Key in Europe, LEED in the US and Travelife worldwide. These buildings run on renewable energy, use environmental-friendly cleaning products and practise sustainable resources like solar power, rainwater harvesting and energy-efficient lighting. While The Palazzo in Las Vegas is the largest LEED-certified building in the world, Hi Hotel located in Nice, France, uses recycled paper, organic paint, eco-friendly cleaning products and organic food. There’s a variety of ‘green’ hotels that blend luxury and sustainability too, such as Park Hyatt and Hadahaa in Maldives, Sandpearl Resort in Florida, or Mockingbird Hill – Port Antonia in Jamaica. Green Trivia: You can find ‘GreenLeaders’ programmes that list eco-friendly hotels, B&Bs, guest houses and more, giving detailed information on the eco initiatives of the properties. If you really have to take the airplane, select non-stop flights whenever possible. It’s actually take-offs and landings that produce most of a plane’s carbon emissions, so hopping between flights makes matters worse. Also, try to fly in energy-efficient aircrafts such as Boeing’s 787 Dreamliner and the Airbus A350 that consume up to 20% less fuel. There are many airlines like Delta and United that offer carbon offset programmes, where you can calculate your flight’s carbon footprint on the airline websites. They then equate a trip’s carbon footprint with a sum of money and donate to carbon reduction projects such as forest conservation or harnessing renewable energy. Green Trivia: The heavier your luggage, the more airplane fuel is needed, therefore, it’s better to pack light when you’re flying. Ditch the airplane and opt for more environmental-friendly travel options, such as bicycles, green trains, electric vehicles or hybrid buses and cars. Trains emit 3-7 times less gas than airplanes, and if you plan well, they can be just as time-efficient as flights. You can reach Paris from London on a train in less as 2.5 hours, roughly the same amount of time it would take to get to Heathrow from London! You can plan exciting weekend breaks to Barcelona, Dublin, Prague, Rome, Amsterdam and Berlin – all of which are accessible from the UK by train. If you’re traveling with family or friends and the destination is within driving distance, take a road trip. Hire a car that has lower carbon emissions and higher fuel-efficiency ratings, such as the Hertz ‘Green Collection’ or ‘Green Cars’ by Avis and Europcar. Green Trivia: Many rail companies help you to compensate for the carbon footprint you create when travelling. Amtrak allows its passengers to purchase carbon offsets along with their train tickets. Can there be a better way to explore a destination than walking your way around? Taking walking tours of the city or beach resort enables you to admire the sights, sounds and scenery first-hand, as well as mix with the locals and experience their culture in a more detailed way. Sandemans offers free walking tours whereby you can explore amazing European cities like Amsterdam, Paris, Prague, Barcelona, Dublin, Lisbon and many more. Green Trivia: If you like excursions, you can find lots of environment-friendly organisation such as the Nature Conservancy, Sierra Club and WWF which provide low-impact eco trips that pledge not to harm nature, wildlife or people. Avoid stuffing your suitcase with eco-unfriendly travel products like plastic bottles, bags and travel-size toiletries, many of these contain chemicals that can be toxic for the environment. Instead, pack eco-travel products like GoToob travel bottles, or jute fibre bags to carry back home souvenirs that you’ve purchased. While eating-on-the-go, opt for reusuable bamboo utensils like fork, knife, spoon and chopsticks. And yes, don’t forget to bring a solar-powered device charger for your phones and iPads. If you’re packing for a beach holiday, give your kids biodegradable beach toys such as buckets, shovels and sand moulds – fun and friendly for all! Green Trivia: Recent studies have shown that standard sunscreens can be harmful to people and the ocean. To be extra safe, pick up organic, environment-friendly sunscreen for your next beach holiday. Try to stay away from international restaurant chains or imported food – items flown or shipped in from abroad means more waste and greenhouse gas emissions. Instead, explore colourful food markets, street stalls and local restaurants that use locally grown and organic ingredients. Rosemary’s in New York, Septime in Paris and Azurmendi in Spain are some excellent examples of how delightful dining at eco-friendly restaurants can be – so be sure to check them out next time you travel! Green Trivia: Whether you’re looking for organic ingredients or a local menu, restaurants that have been rated by the Sustainable Restaurant Association are where to go.